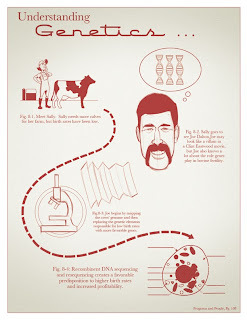 ILLUSTRATION: NOAH KROESE: Programs and People: Cows, DNA, and one EPIC mustache. 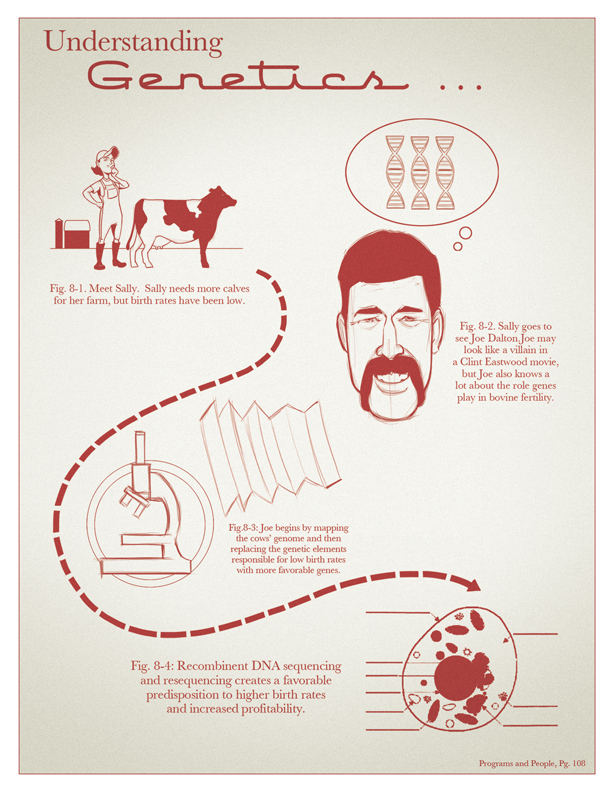 Programs and People: Cows, DNA, and one EPIC mustache. It's "Programs and People" time again! This is always one of my favorite projects of the year. They're great about giving me a lot of time, which allows me to put plenty of thought into the concepts. It also lets me focus on the craft of the illustration itself. Don't get me wrong: the frenzied, skin of my teeth, blurred vision and sleep deprivation of split-second deadlines is great for taking years off my life, but sometimes it's nice to have a little more breathing room. And this year, I'm going to need all the time I can get. The subjects of these articles are usually fairly complex, which means distilling them into one cohesive and visually-interesting illustration can make for some gnashing of teeth. But this year it's a REAL peach. 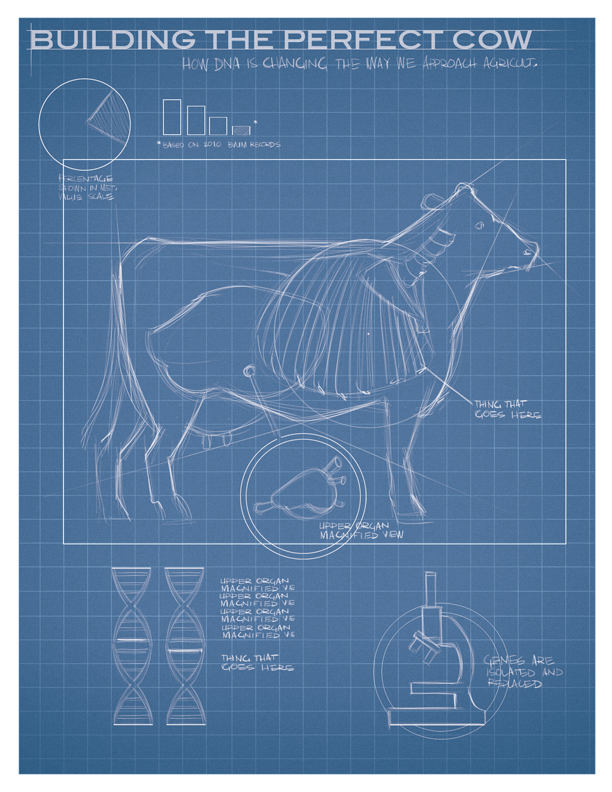 This year, the article is about using genetic engineering to combat bovine infertility. Put that in your pipe and re-sequence it. 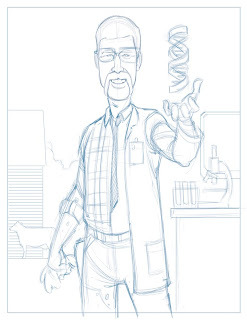 One of the challenges (aside from figuring out how to even begin translating that subject into a single, digestible illustration) has to do with the subject matter itself. Yes, it's extremely complicated. But there's another factor that makes this project even more difficult: It's icky. 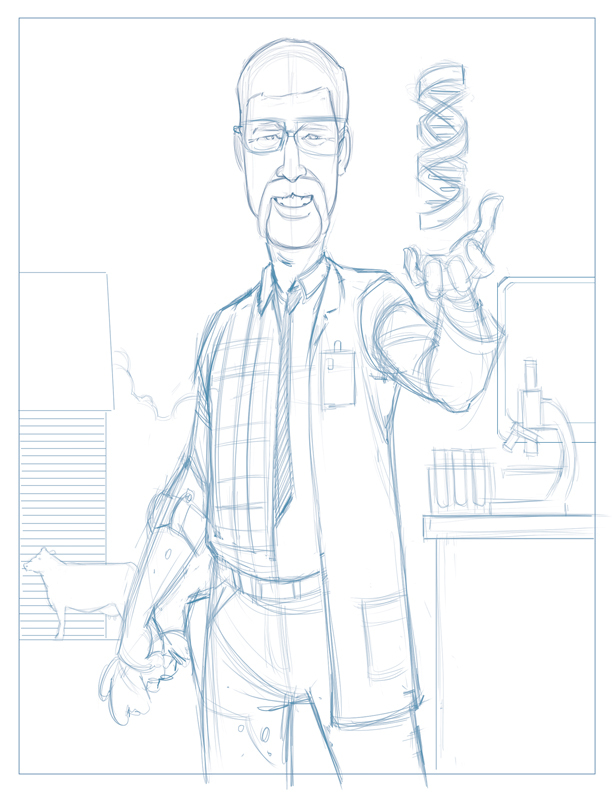 That's a pretty technical term, so let me explain: Over the years, I've done a lot of agricultural illustration. This isn't my first time to the rodeo. It isn't even my first time to the cow drawing rodeo. But none of those subject matters was biological or medical in the way this one is (we're talking about cow reproduction and reproductive systems, after all). 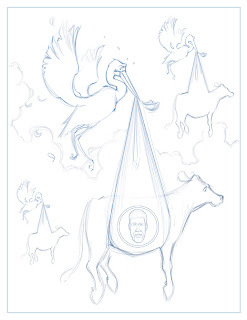 And in thinking about how to approach this illustration, it occurred to me that it would be tough to avoid an illustration that's either: A.) Creepy, B.) Dry (overly scientific) or C.) Awkward, like a video in Health class. 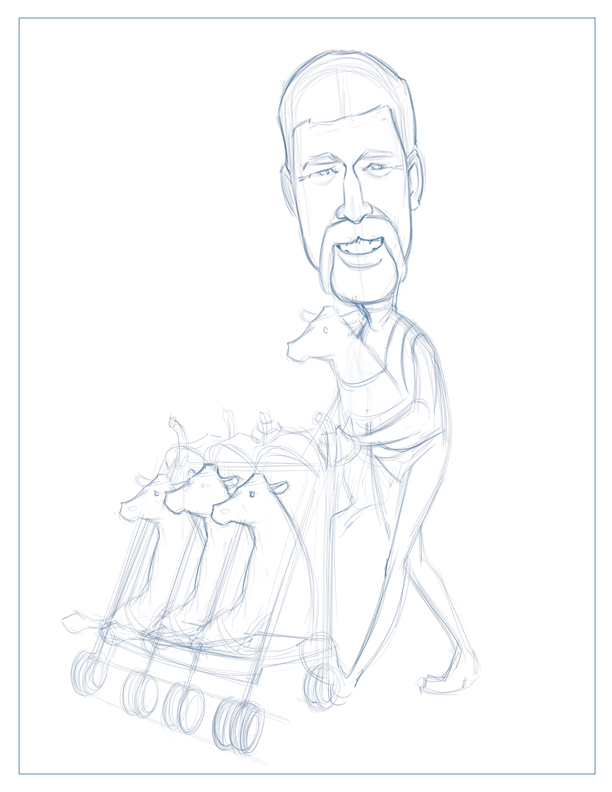 The guy being caricatured is Joe Dalton, who runs this program at UI. I had envisioned this concept as a funny, light-hearted approach. Something like a Peter de Seve New Yorker cover with bright colors and funny expressions. But I think it's a little creepy. 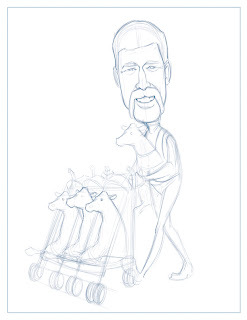 The idea of a man with a calf in a baby sling is a little off-putting. Ultimately, I think it could have worked if it was cartoony enough. If there's enough exaggeration, the illustration is pure farce and I think that eliminates the creepy tone. But ultimately, I'm glad this one wasn't chosen. How do you talk about where babies come from without talking about where babies come from? Avoidance. I'm pretty sure the stork myth was made up by squeamish parents who couldn't bear to acknowledge...you know. Anyway, this is another concept in the "light and funny" vein. I like the idea and think it would have worked ok, but ultimately I don't think this concept was related enough to the original subject matter. Where exactly would we be if there was no attempt by Noah to shoe-horn in some 1950s imagery? I thought it would be fun to create a page from a fictional grade school textbook, but then to use that page to explain an extremely complex scientific process. I think this is one of the stronger concepts and it would have been fun to bring to fruition, but it wasn't chosen. C'est la vie. Building the perfect cow. This one focuses on the engineering side of the process. 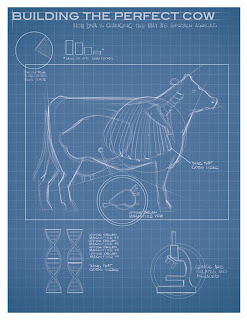 It gets a little medical, what with the x-ray drawing of the cow, but I figured it would be acceptable if that part of the illustration stayed in the blue and white blueprint/schematic form. 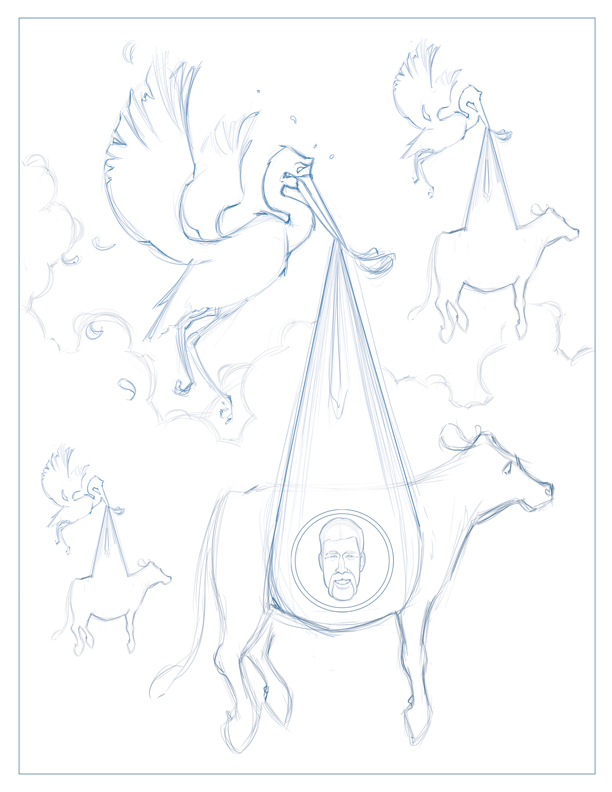 I think this concept was a good way to convey the complexity of the process while still being visually interesting. This concept is Joe Dalton, split down the middle. One half shows the manual labor side of the process (farm and field) while the other shows the more scientific aspect (the lab). Plus, lookit that mustache. I mean, daaaaang. While this concept wasn't my favorite (the blueprint was my favorite), I think this concept is a great fit for the article. It conveys the complexity of the process and has enough elements in it to be visually appealing. It's also not icky, so...bonus. There were so many ideas that were never sketched. My favorite of which was probably the "Cow-culator", which would have been a calculator made by Joe Dalton that only had one button: Multiply. Of course, that's not really a full concept, so it wouldn't have worked. Oh, well. Still makes me chuckle. Now all I have to do is draw it. Which is maybe the best part. The deadline is getting closer. I'll try not to have a cow.